Take just the parts of the PatientSource platform that you need. It will interoperate with your other systems. The PatientSource platform is modular meaning that you can pick and choose the parts you require for your healthcare organisation. All our modules work together seamlessly. Our solutions are fully interoperable and can connect to other healthcare software ensuring that data from those systems is available. Single Vendor Solution: Run everything on PatientSource. Never need worry about keeping a cluster of systems supported again! 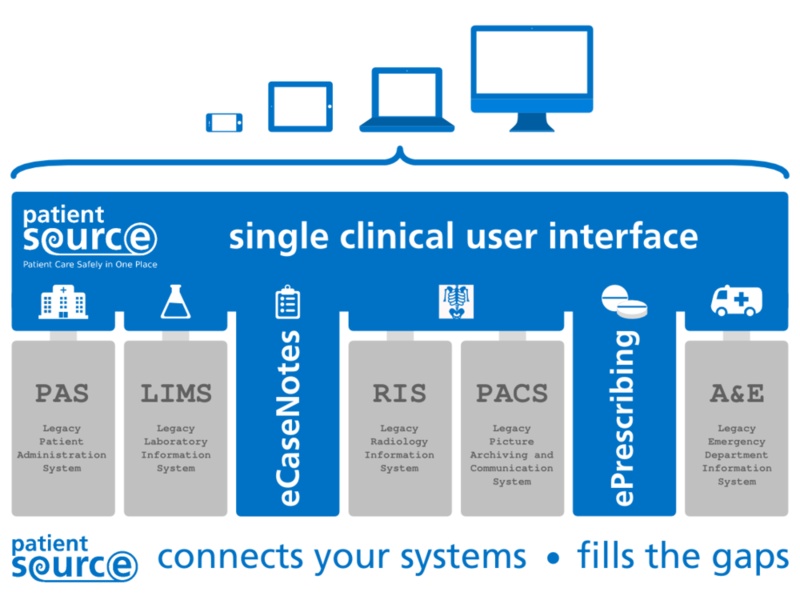 Clinical Portal: Unify all your underlying legacy systems into one coherent, user-friendly clinician-designed user-interface, which works on tablets too. Our existing modules provide a comprehensive electronic healthcare solution that is easily expandable as your hospital grows. PatientSource’s Patient Administration System (ePAS) is fully featured and compatible with most major legacy PAS systems. This means you can automatically import all your information from existing PAS systems and run purely on PatientSource, or you can run PatientSource on top of your existing legacy PAS system. This allows you to honour existing long-term PAS contracts, and also make a gradual transition. The PatientSource ePAS module supports all standard PAS functions and has additional features suitable for any modern healthcare organisation. PatientSource’s electronic Case Notes module (eCasenotes) provides a timeline of a patient's care. Records can be drawn from multiple systems and organisations into a single coherent summary of the patient's history. This module can be used to replaces handwritten ward notes, admission proformas and clinic letters. Using PatientSource's electronic Case Notes module beats paper notes as it is searchable, convenient, accessible simultaneously in multiple sites and more secure. Not to mention more legible! PatientSource allows you to sketch medical diagrams and we provide templates tailored to your specialities. You can also take pictures and annotate them. The electronic observations module (eObservations) is a fully featured system for recording and tracking patients’ vital signs. Observation charts are an important method of detecting patient deterioration early. PatientSource displays important observations as a graph allowing you to overlay multiple graphs for easy trend-spotting. eObservations highlights abnormal observation values, and automatically calculates National EWS scores, raising an alert at the top of the page where values are particularly concerning. Our electronic prescriptions module (ePrescribing) replaces card drug charts increasing patient safety by carrying out automatic checks on prescriptions and alerting clinicians to problems. ePrescribing is driven by the British drug database and checks all prescribed drugs against known patient allergies, for drug-drug interactions and for the appropriate dose, route and frequency of administration. PatientSource's electronic investigations module (eInvestigations) seamlessly stitches together all of your lab and radiology systems to provide one central interface where clinicians can requests investigations and view results the moment they are available. Technicians and reporters can process requests and issue reports. Clinicians can review results as a table of data, and even view individual result trends on a graph. Our built-in radiology viewer allows fetching of images from radiology systems such as PACS, without requiring any additional logins or installation. PatientSource's electronic admission and discharge module tracks patients throughout their stay at your clinical practice. It allows patients to be booked into clinics or wards and discharged with discharge letters and medications automatically inserting relevant information from the patient's drugs chart, investigations and case notes to save clinicians time. Discharge medications can be cross-checked by pharmacists and are subject to the same drugs database checks as within our ePrescribing module. Diabetes is a pandemic disease, with the incidence increasing year-on-year in developed countries. It is a significant cause of morbidity and demands a significant proportion of healthcare resources. Thorough management of diabetes is the key to keeping patients healthy and avoiding long-term complications. PatientSource's eDiabetes module provides a reliable tool for clinicians to review diabetics and their care plans in an outpatient setting. Clinicians can easily identify and address shortcomings in their patients' care and also view trends over time. eDiabetes is fully compliant with NICE guidelines for key health tests and measures, ensuring that your patients receive the best possible diabetic care. All data recorded in the module can be automatically audited in real time to assess the performance of your diabetes service. Incident reporting is the keystone of risk management. Good incident reporting and follow-up procedures are essential for any healthcare organisation. PatientSource provides a robust system for staff to submit incident reports, and for risk managers to review and respond to those reports. All activity is secure and is logged and reports can be generated ensuring the hospital can defend itself with evidence when required. PatientSource's eIncidents module eliminates the need for separate third party incident reporting software, thus reducing your software licensing costs.